It’s summertime and that means more time for BBQs at the pool or beach. Well, I have a delicious cocktail to help ensure that your BBQ or pool party are a success!! Ingredients: La Pinta pomegranate infused tequila, agave nectar, lime. La Pinta Pomegranate Infused Tequila is handcrafted in Mexico by Casa Tradición Master Distiller Arturo Lomeli and brings together the unparalleled smoothness of Clase Azul Plata tequila with the crisp taste of pomegranate to produce a delicious blend of unique flavor. Clase Azul Plata is ultra-premium non-aged tequila that boasts the aroma of fresh agave. Featuring a bold red color, La Pinta is 38 proof and provides the right balance of sweet flavor and tartness. What is your favorite summertime cocktail? Have you tried The Skinny Pina Colada? 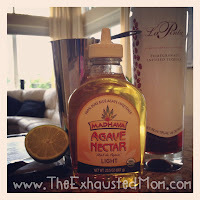 Don’t forget for more Thirsty Thursday ideas, check out my girl Amanda at Anti Mom Blog! **Disclaimer: I was provided a sample of La Pinta Pomegranate infused tequila for review purposes only. All opinions are my own. No compensation was received for this review. La Pinta Pomegranate infused tequila sounds absolutely delicious! I’ll have to look for it to make my own Pomeritas! Ready to enjoy one…NOW! It looks delicious! Loved the video! Who does your videography?? 😉 That drink looked yummy! Maybe you can make one for me in a few weeks??? ?